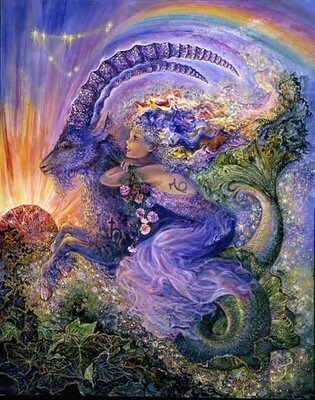 The full moon in Capricorn opposes the Sun in Cancer. The first full moon after the solstice. The next full moon will be a Lunar Eclipse in the sign of Aquarius, two weeks before the Total Solar Eclipse that will be moving over the United States. We are likely to be more sensitive to the comments made by others. We may swing through a few highs and lows as the day progresses, especially with the T-square to Jupiter in Libra, the sun's conjunction to Mars in Cancer, and the moon's conjunction to Pluto retrograde in Capricorn. We will have lots to think about during this full moon. On the opposing side of the T-square is a Wedge aspect pattern to Neptune retrograde in Pisces. This has the potential to cause us to be creatively dazed and confused. An excellent time to journal our dreams or epiphanies. Meditation can also help us to deeply explore our fears and confusion. Just be aware that family is likely to lean in, heavy, with expectations that we may struggle to deal with. Mercury in Leo can cause our thoughts to slow down. Walk away from the drama. Mercury is sextile to Venus in Gemini. There's artistry in this connection that helps us to problem solve more intuitively. We may feel more outgoing and willing to initiate new relationships. Venus is transiting over a critical degree of Gemini, adding extra pop to our ideas. Saturn retrograde in Sagittarius is hanging out on a lone mission to rebuild better habits based on past experiences. We are less likely to react impulsively or gamble on that wing and a prayer. Take advantage of this time to reflect on ways to develop better perspectives. Overall, this full moon chart is balanced in most areas, with the exception of the fact that there's a large number of Cardinal quality placements. This can help us to be more optimistic. Where this can impact our future is failing to take the time to do the research. Do not rely on another's assurance that their idea is the best idea. Also, don't be the pusher of ideas that could ultimately harm another. Recognize that each person has their own best plan of action, and ours may not fit their model. The phrase "I don't know" is important in any language.